The Men's Keb Eco-Shell Jacket from Fjällräven is a pliant technical jacket for demanding adventures in constantly changing weather conditions. The face fabric is made from recycled polyester yet still offers a high degree of breathability and is 100% waterproof to ensure protection when the rain falls regardless of your chosen activity. With the improved fit for the new season, the Keb Eco-Shell is now even easier to repair. The cut of the jacket has been carefully considered as has the placement of features to ensure excellent freedom of movement while still being compatible for use with harness' and hip belts without losing the use of pockets. 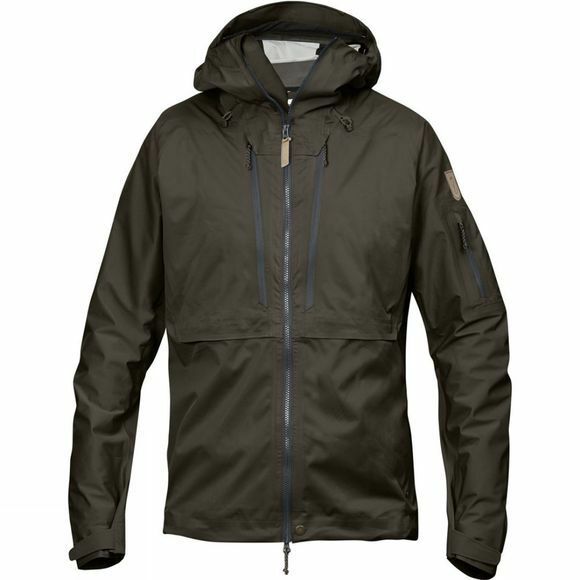 The main 2-way zip of the jacket offers excellent options for ventilation and fit while the inner storm flap keeps stray raindrops at bay. The improved hood has a bit more space around the neck, a better fit for wearing over a helmet and is easier to repair – the cords are now on the outside so easier to rethread if needed. In addition, the vents now feature two-way zips for greater temperature regulation. The jacket is made in durable G-1000 Eco and stretch fabric and perfect for trekking and alpine adventures, all year round. In 1960, Åke Nordin founded Fjӓllrӓven in his basement in the Swedish town of Örnsköldsvik. From its very first innovative framed backpacks and lightweight outdoor jackets, Fjӓllrӓven has stayed true to its original mission of making it easier for more people to enjoy and stay comfortable in the great outdoors. Passionate about protecting the environment that inspires it, Fjӓllrӓven is always looking for new ways to reduce its environmental impact; from its innovative, PFC-free Eco-Shell fabric to its highly ethical and fully traceable Down-sourcing programme.